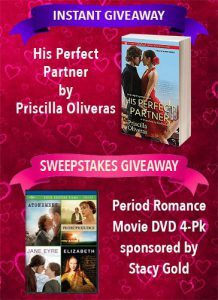 The 14 Days of Romance Giveaway Starts February 1st! Whether you’re with the love of your life, going it solo, or something in between, every romance reader deserves a little extra love on Valentine’s Day. 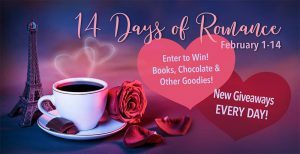 That’s why 50+ romance authors (including me) have gotten together to offer you an amazing set of romance giveaway prizes every day, for the next 14 days! Enter now, and visit daily, for your chances to win ebooks, Godiva and Lindor chocolates, luscious Victoria’s Secret lotion, booklover’s mugs, chick flick DVDs and more! fresh prizes available each and every day for the 14 days of this romance giveaway. Let us make your Valentine’s Day sweeter!